Tapeless, file based video acquisition has widely become accepted as a replacement for out-dated tape based systems. Recording times are far longer than for traditional tape, there are no drop-outs and using Datavideo's Direct to Timeline technology, you will speed up the process from acquisition to editing, thanks to file transfer, rather than traditional capturing. 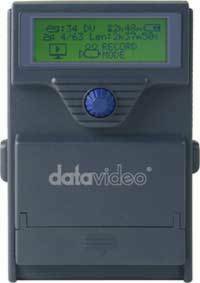 The Datavideo DN-60 utilizes the latest solid state technology of removable and high-capacity CF memory cards, providing hours of continuous high definition recordings, enabling you to take advantage of tapeless acquisition in even the toughest environments. The DN-60 is powered using four traditional AA batteries, or widely available rechargable AA batteries. A set of batteries providing more than two hours continuous recording, depending on the type of battery used. Also included is an external power supply. The Datavideo DN-60 connects directly to your existing DV or HDV camcorder via a single FireWire cable. The DN-60 is lightweight and easy to mount to camcorders. It is perfect for news gathering, location shoots, security systems, scientific and medical recording.